The name was originally perhaps a nickname, Skirmisher. meaning 'hardy fighter', or more likely a version of escrimeur, French for swordsman. The first bearer of the name was one Alexander Carron, who received the hereditary title of Royal Standard (or Banner) Bearer of Scotland after an exceptionally brave action in the presence of the then King of Scots whose army was crossing the river Spey. Carron's descendent, Alexander Scrymgeour, was an adherent of Sir William Wallace, and the only Charter known to have been granted by Wallace as 'Guardian of the Realm' confirmed him as Royal Banner Bearer, granted him lands in Angus, and made him 'Constable of the Castle of Dundee'. After Wallace's death Scrymgeour supported King Robert the Bruce, was captured by the English in Bruce's defeat at Methven in 1306 and hanged at Newcastle-upon-Tyne. This was not the only time that bearing the Royal Banner proved a hazard as well as an honour, as several Chiefs of the Clan died in battle. At Flodden. the Clan Chief being too young to bear arms. his uncle, acted as Banner Bearer, and afterwards died of his wounds. The Scrimgeours were for many years closely connected with Dundee; until the 17th Century they retained the title of 'Constable of Dundee and many Provosts of that City were Scrimgeours. The town residence, Dudhope Castle, was wrongfully taken from the lawful owners in the 17th Century (see below) and never recovered. They also had extensive lands in Argyll which justifies the Scrimgeour claim (approved by the Lyon Court) to be a 'Highland Clan'. In their day a number of the Scrimgeour Chiefs were knighted, and in the reign of James VI the then Chief was created Viscount of Dudhope. His grandson, the third Viscount who had been a companion of Charles II during that King's 'exile' in Scotland, was created Earl of Dundee after the Restoration. On the death of this, the first Earl. it was necessary to go back many generations to find a male heir entitled to succeed and King Charles was persuaded by his favourite, the notorious Duke of Lauderdale, that the line was extinct, and the lands and honours associated with it should be granted to his brother Charles Maitland of Hatton. This the King agreed to, although there were two Scrimgeour claimants (one of whom was found more than two centuries later to have had a valid claim). The weakness of Hatton's position was such that he seized all the Scrimgeour documents from Dudhope Castle. How the honours and titles (but not the original lands) were regained by the present Earl's father after hard-fought actions culminating in 'The Standard-Bearer Case' in the House of Lords, is told in fascinating detail in the Clan History ('The Scrimgeours and their Chiefs. Scotland's Royal Banner Bearers') published by the Clan Association in 1980. Its authors, R. W. and Jean Munro, are well known writers of Scottish family histories. Besides giving in detail what has been summarised above about the heads of the Clan, accounts are given of others of the family - one example, the Canadian V C. in honour of whom 'Mount Scrimger' in the Canadian Rockies was named. There is a lot more about our history in the Skirmisher (see front page), and in the book "The Scrimgeours" published by the Clan Association (see Clan Goods). The general history of the clan relates to Scotland/ Dundee/Constables/Earls etc and can generally be considered "closed". We class accounts of Scrimgeours around the world as recent history. Please do not see this as reflecting relative importance, rather a classification to assist you, the reader, in finding information - and also to give us a framework which can expand. 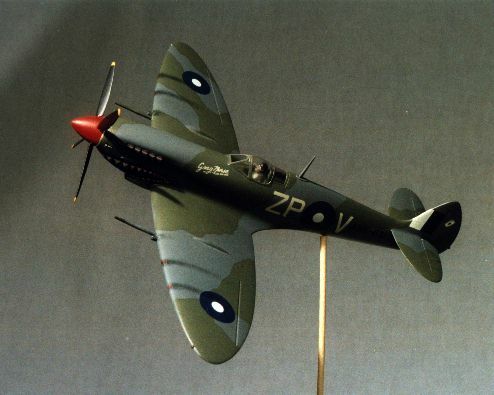 The second last Japanese aircraft to be shot down in World War II fell to F/lt Scrimgeour of the Royal Australian Air Force, flying this Mark VIII Spitfire. Extract from "Air War against Japan 1943-45", published by Australian War Memorial. Two Spitfires of No 457 Squadron, which was on ground alert, were ordered into the air on the 20th June 1945 when an enemy raider approached. they climbed to 13,000 feet and while circling near Sipitang village, sighted a Dinah some 1,000 feet below. Flight Lieutenant Campbell made an attack on the enemy from below, opening fire at 350 yards and closing to 50 yards. Then Flight Lieutenant Scrimgeour* made an attack from slightly below and at the rear, opening fire at 350 yards and closing to 50 yards. When the second attack was broken off, the port engine of the Dinah was on fire with pieces flying from it. Both pilots made further attacks and scored hits. They followed it down and saw it crash and explode on the ground fifty-five miles from Labuan. This was the Squadron's first air combat since 1943 and boosted the spirits of the men considerably. F/Lt S G Scrimgeour 402906 of 453, 24 and 457 Squadrons. Previously a clerk in Waratah NSW, born in Newcastle NSW on 12th December 1920. There are lots more stories in the Skirmisher (see front page).